I was quite taken aback when this disc arrived for review. ‘Beethoven: Organ Perspectives’ is an intriguing title. I wasn’t aware that the composer had composed anything for the instrument. Delving deeper, things became clearer. In his youth, Beethoven studied the organ, and between 1784-1792 had held the position of second Court Organist to Christian Gottlob Neefe in Bonn. Some of the earliest compositions featured on the disc were undoubtedly written for the organ. These include the Fuga in D major, WoO31 (1793) and Two Preludes through all the major keys. The latter pieces are what are termed ‘modulation studies’ - the first contains 17 modulations, the second 26, taking the performer twice around the circle of fifths. At the start of the CD we hear five works for flute-clock WoO33. These were self-playing organ instruments which were apparently all the rage in Vienna around 1790 until about 1820. In addition to these works, Aeolus have included pieces that the composer may have played on the organ given their suitability for the instrument. So the general thrust of the programme suggested the title ‘Organ Perspectives’ rather than ‘Organ Works’. All of the pieces here are miniatures, but the programme is suitably varied. I didn’t imagine that the Bagatelles would please me played on the organ. Quite the contrary, they work very well. I particularly like the C major, Op.33, No. 5, Kaczor contrasts the diaphanous opening and close, with a darker registration for the middle section - very effective. Perhaps Op. 33 No. 1 doesn’t quite adapt so well. Her quirky registrations in the C minor, WoO 52 showcase the infinite capabilities of this wonderful instrument. The sombre melancholy of the F minor Prelude WoO55 is far removed from the genial, good-humoured Fuga in D major, WoO31. The Grenadiersmarsch of 1803 could grace the conclusion of any church service. 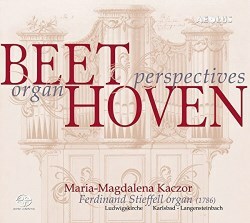 The Polish born organist Maria-Magdalena Kaczor's stylish playing and artful musicianship is compelling. I think that her imaginative registrations serve this music well in terms of variety, colour and allure. I must single out Aeolus’ excellent documentation for special mention. The 48-page accompanying booklet contains extensive discussion of the music and background by Christoph Martin Frommen. Also included is a wealth of information on the history and specifications of the Ferdinand Stieffel organ. There are some very fine photographs in addition. The SACD sound is of demonstration quality, and three bonus tracks are available to those with an SACD compatible player. As an enthusiastic devotee of organ music, I am delighted that this release has opened up yet another door to me.